Posted in: Fatdog's Bazaar of 10,000 Things. Tagged: Elly Simmons, International Women's Day, Posters. Click to enlarge. Artwork by Elly Simmons. 17 ½” x 24”. 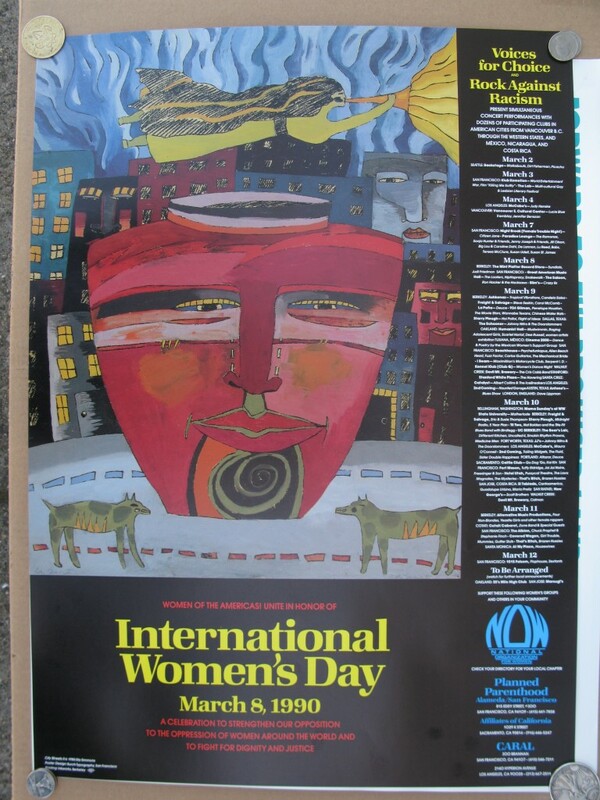 Description: A Tribute to International Women’s Day, March 8, 1992, featuring performances across the country. With artwork by Elly Simmons, this 17 ½” x 24” poster is in mint condition and will be packaged in a mailing tube. Returns: Two weeks to return poster for refund — buyer pays for return postage. Checks welcome. Posted in: Fatdog's Bazaar of 10,000 Things. Tagged: Elly Simmons, International Women's Day, Posters, Rock Against Racism. 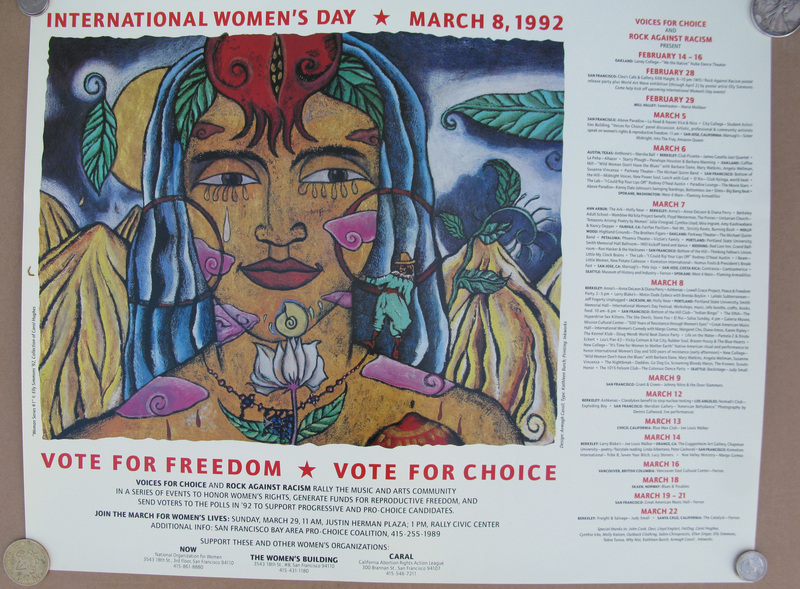 A Tribute to International Women’s Day, March 8, 1990. Featuring performances across the country and Vancouver, Mexico, Nicaragua & Costa Rica, March 2-12, 1990, featuring such artists as Walkabouts, Dirt Fisherman, Picacho, Lucie Blue Tremblay, Jennifer Berezan, The Ramonas, Sonja Hunter & Friends, Jenny Joseph & Friends, Jill Olson, Big Lou & Caroline Dahl, De Lannon, Lu Reed, Babs, Teresa McClure, Susan Udell, Susan St James, Sundials, Judi Friedman, The Looters, HipHopracy, Snakewalke, Ron Hacker & the Hacksaws, Crazy 8s, Tropical Vibrations, Condela Salsa, Steve Seskin, Carol McComb, Deuce, Penelope Houston, The Movie Stars, Wannabe Texans, Chinese Water Rats, Hoi Polloi, Flight of Ideas, Johnny Nitro & The Doorslammers, Mudwimmin, Raging Adolescent Girls, Scarlet Harlot, Dee Russell, Psychefunkapus, Alien Beach Head, Fuzz Factor, Carlos Guitarlos, The Mechanical Bride, The Cris Cobb Band, The Havering, Albert Collins & The Icebreakers, Haunted Garage, Dave Lippman, Motherloade, Eric & Susie Thompson, Midnight Radio, 5 Year Plan, Nat Bolden and the Tite-Fit Blues Band with Birdlegg, Different Kitchen, Uncalled 4, Smokin Rhythm Prawns, Medicine Men, Maura O’Connell, Toiling Midgets, The Fluid, Sister Double Happiness, Altazar, Deuce, Go Dog ‘Go, Kai Kin, Tuffy Eldridge, Jai Jai Noire, Freesinger & Son, Pussycat Theatre, The Lava Magnates, The Mysteries, Brazen Hussies, Cantoamerica, Guadalupe Urbina, Maria Pretiz, Scott Brothers, Catman, Four Non-Blondes, Yeastie Girls, Zone Band, Chuck Prophet & Stephanie Finch, Girl Trouble, Mummies, Gutter Sluts, Housewives, Flophouse, Sextants. Brought to you by Voice For Choice, Rock Against Racism, Fat Dog & Subway Guitars, a renowned Berkeley CA business for over 40 years. Returns: Two weeks to return poster for refund. Buyer pays return postage.